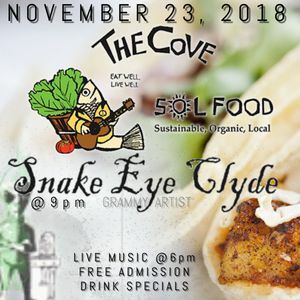 So who is Snake Eye Clyde? They are a trio of very experienced performers and musicians. Winners of three Grammy awards, voted best beer drinking bar band twice, voted best new Texas artist, best songwriter, songwriter of the year, best guitarist, ect. and on and on, but who cares, right. The band plays a mix of original roots Texas rock country, rock, blues, funk, as well as, covers from the 60's to today. Entertaining and making sure no one leaves without having a good time is really what this band is about. If you are looking to just come out and chill, don't come, this band will put you over the top and draw you into the show. If you have not seen them, you must check them out live, that's where they shine! A true Texas outlaw band! Hitting the stage at 9:30pm! Free Admission, Drink specials and so much more that only The Cove can offer!!! Sustainable, Organic, Local restaurant, beer garden, live music venue, dog friendly, kids' playground, laundromat and car wash! The Cove has it all!